When Black Mirror began airing in 2011, it inevitably drew comparisons to The Twilight Zone. The hyperbolic narratives served as warnings of our technological advancements the same way Rod Serling chided its viewers’ morality. Creator Charlie Brooker also tended to take the page from Serling’s book of leaving an ominous cliffhanger ending. When Netflix released the third season though, the series had undergone a number of changes: flamboyant colors, American accents, and a few happy endings. “San Junipero” is one of the most widely beloved episodes to come from Black Mirror, and it has a remarkably positive ending. Even the ending of the film-length “Hated in the Nation” leaves a viewer with a sense of pride. The fourth season takes the satisfying ending and runs with it, more often for the better. This season saw the various directors playing with style the most. The only real departure we’d seen had been in “San Junipero,” because even “Nosedive” and “White Christmas” placed different filters on Black Mirror, but never shook up the style. “Metalhead” and “USS Callister” embrace film noir and 60’s Sci-Fi, respectively. “Metalhead” is also the most similar to an older Black Mirror episode though. Very little is explained as the protagonist runs away from a robotic dog. It’s like watching the climax of The Third Man and Halloween all in one. “Callister” is an exploration into sentience and virtual reality, but there’s also a ton of references to a Star Trek-like show. The stylistic shifts mirror that of “San Junipero,” but the unsettling nature of the episode seems incredibly pertinent to kick off the season. The easiest statement about Black Mirror is that it comments on technology, which it does, but like Serling before him, Brooker is more concerned with the social and political discussion around the tech that he imagines for his universe. The Jodie Foster-directed “Arkangel” does this the best. It’s a warning about using apps like Find My iPhone or Life 360 to have surveillance on your children. Sara grows to resent her mother leading to her being a more rebellious teenager than she would probably have been without the constant monitoring. The season opener is all too timely as it sees an all-star game designer, who secretly creates digital, sentient forms of his coworkers to take out his sadistic fantasies. His relationships with the women are all born out of manipulation and cruelty, all too similar to someone like Harvey Weinstein abusing his power. “Black Museum” is almost self-aware in its exploration of the speculative tech it introduces, but the larger story resembles that of the OJ Simpson trial. The idea of being stuck in a virtual prison cell shows the cruelty of our prison system, and the systematic racism of the police and prison. 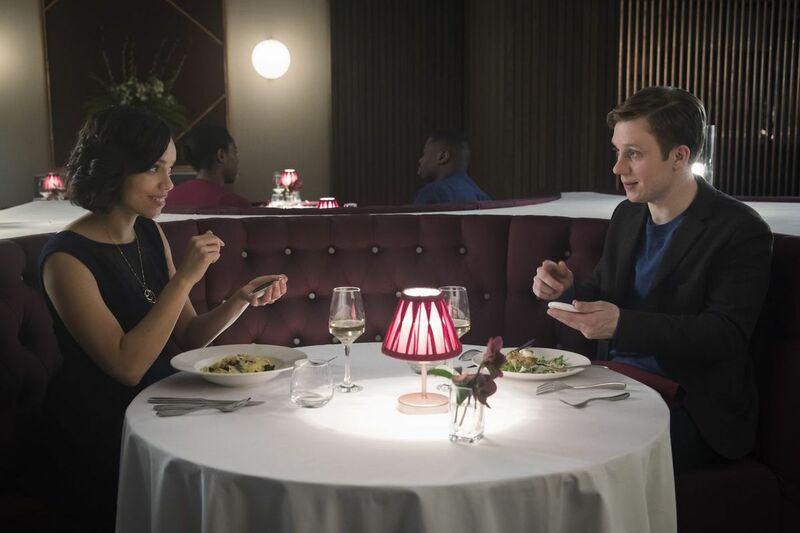 “Hang the DJ” seems incredibly critical of dating-apps. Showing the detached and trapping feelings of constantly swiping on Tinder, the fictional app forces participants into relationships with set expiration dates in order to find the perfect partner, but as The Smiths play, the two protagonists escape the confines of their virtual life, only shown to be avatars for a perfect match about to meet in a bar. Each of these episodes feels very much like a classic Black Mirror episode, but where “Arkangel” follows suit on the grisly ending, “Hang the DJ” leaves the viewer with a sense of relief, excitement, and joy. Of the six episodes this season, four are left with positive endings. Each can get really pessimistic, but they tend to end on some sort of positive note. Even the found footage-esque thriller “Crocodile” leaves with a sense that the main character is going to get her comeuppance, as police use their memory scanner to check a hamster at the crime scene. “USS Callister” sees the perverted coding creep dying in his own simulation as Cristin Milioti and her crew escape to a free internet. The end of “Hang the DJ” looks like the last scene in a rom-com. Most of all, when the holographic prisoner’s daughter kills the titular museum curator in “Black Museum,” it’s an exciting revenge narrative that leaves your average binge-watcher excited. Charlie Brooker gave a heads up that this season would be more hopeful, and although many came to Black Mirror for a dark reminder of The Twilight Zone, it seems now we need the optimistic escapism.